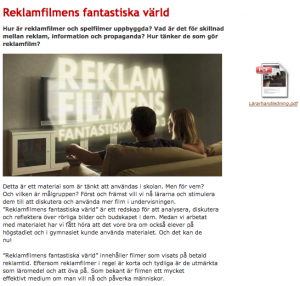 Folkets Bio Filmpedagogerna has worked with film and media education for more than 20 years. We work locally, regionally, nationally and internationally with teaching film- and media education. 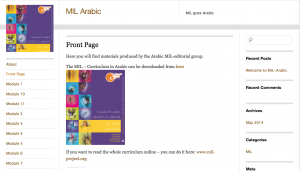 We also produce teaching materials. Our method is simple. We use the materials we have around us, the media that is current and popular amongst students. Therefore most of the materials used are popular culture. We meet classes of around 20-60 students and in workshop sessions we teach and learn how the media around us is used. Based on these experiences we produce teaching materials. 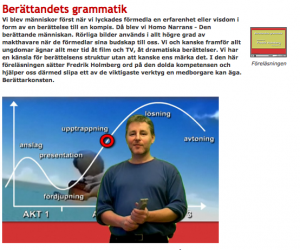 Together with the The Swedish National Agency for Education – we produced the Grammar of storytelling. 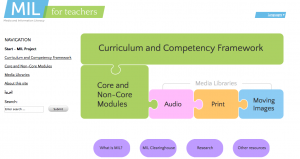 These days Folkets Bio Filmpedagogerna are partners with UNESCO and are creating a platform for work on MIL – Media and Information Literacy. Together with Nordicom and the The Swedish National Commission for UNESCO – we produced a demo-site that you can access here. Folkets Bio Filmpedagogerna are now also members of the UNITWIN Network. 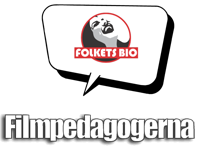 In Sweden, Folkets Bio Filmpedagogerna is an active part in spreading MIL in all parts of the country. We work on all levels, from the practical teaching in schools to the political and administrative domains, as well as in a broad cultural context.